“All Along the Watchtower” is a song written and recorded by the American singer-songwriter Bob Dylan. The song initially appeared on his 1967 album John Wesley Harding, and it has been included on most of Dylan’s subsequent greatest hits compilations. Since the late 1970s, he has performed it in concert more than any of his other songs. Different versions appear on four of Dylan’s live albums. Covered by numerous artists in various genres, “All Along the Watchtower” is strongly identified with the interpretation Jimi Hendrix recorded for Electric Ladyland with theJimi Hendrix Experience. The Hendrix version, released six months after Dylan’s original recording, became a Top 20 single in 1968 and was ranked 47th in Rolling Stone magazine’s 500 Greatest Songs of All Time. 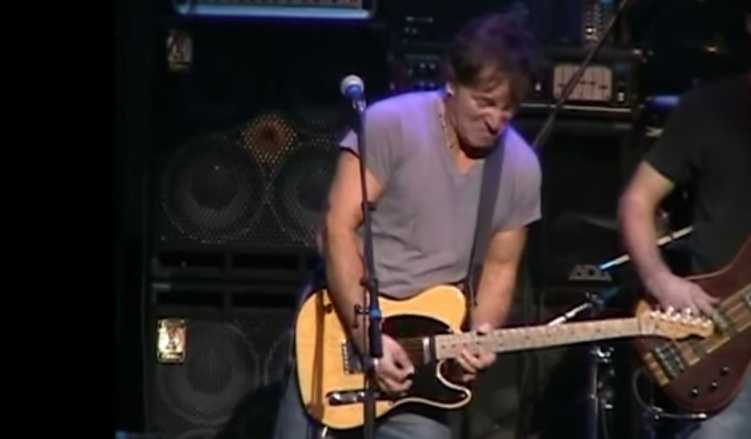 Today we present a fantastic version by Bruce Springsteen (w/ Exit 105). Bruce Springsteen with Exit 105 – Bob Dylan’s “All Along The Watchtower” at Heinz Hall in Pittsburgh, PN on December 2, 2004. Concert for Flood Aid with Joe Grushecky and the Houserockers, benefiting Pennsylvanians who suffered damage from Hurricane Ivan in September.